You may have not seen the Opal apples just yet, but you will soon. I used Opal Apples in making my caramel apple martini. Opal apples are unique apples that resist turning brown when you cut them, so this made it perfect for cocktails. I now can garnish with a slice of apple, and I don’t have to worry about my apple turning brown, or tasting like I squeezed lemon juice on it to keep it from turning color. I was lucky to try one of these new apples you may see in your grocery stores (they are available at Costco as well). If you haven’t seen one before, these apples are a bright shade of yellow. Opal Apples are actually a cross between golden delicious and Topaz apples. The result is a crunchy, crispy, sweet apple. These would be perfect to cut up and put in lunch boxes, or to serve on a fruit tray. In my case, I made a cocktail out of mine. I have always loved a good cocktail. Apple martinis aren’t something that I particularly enjoy going out for, as so often they are made with a liquor that is bright green. That isn’t a color that comes naturally from apples, and it doesn’t really seem to capture the flavor of a nice crisp apple. So for this recipe I juiced my apples. Each apple yielded about 4 ounces of juice. The juice has a beautiful yellow hue to it, so it makes a colorful drink, plus you are looking at the lovely color nature gave your apple. For my caramel apple martini, I used a nice potato Vodka. I personally love Chopin vodka. It has a nice flavor that mixes so well in a cocktail. I think potato vodkas can be smoother, and I didn’t want to take away from the fresh apple flavor with a harsh liquor. I also didn’t want to use a flavored vodka because that meant I would have to buy a vodka, and I may not like the flavor. Instead I used caramel syrup, because I knew I’d like it, and I could use it again in my coffee. This is a sponsored blog posts and all opinions are 100% mine. 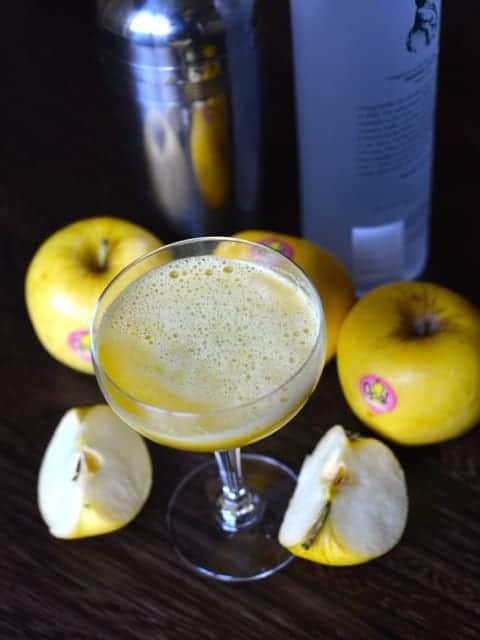 Enjoy a caramel apple inspired martini! Chill martini glass by either placing into the freezer, or by filling your cocktail shaker with water and ice, and pouring the water and ice into your martini glasses. Allow the glasses to chill for a couple of minutes before discarding the water and ice. Into the cocktail shaker add 1 cup of ice, Opal apple juice, vodka, and caramel syrup. Place lid on cocktail shaker and shake vigorously for about 30 seconds. Strain into a chilled martini glass. Garnish with a slice of Opal Apple if you desire. So delicious! I served it with my famous cheese plate.